Last Thursday night I went to a free screening of GasLand hosted by Wild South, a local conservation group, at the town’s haven for local artists. The venue was a small theater that looked handmade from the lumber of the stage, to the faded, hand stitched orange curtain. There were old pianos on either side, possibly generous donations. Most of the audience (approximately 30-40 people) were middle-aged and proudly sporting their grays, with a few young liberals sprinkled in. I sat in the back row, a handmade raised platform with turquoise comfy seats on top beckoned me and made sense to my short stature. Before the film began, a woman with beautiful silver long hair explained to us the film’s premise and how gas companies are considering leasing parts of Alabama’s national forests with possible shale deposits underneath. Before that moment, I was just there for the film. GasLand is an Oscar nominated documentary, directed, written and narrated by Josh Fox depicting how natural gas companies have recently sprung up all over the US. Due to a legal loophole in the Safe Drinking Water Act and other environmental policies, they are able to pollute freely, without disclosing the chemicals in use. The results of their work and pollution are shocking and a clear endangerment to people’s health and the environment. We meet multiple families who have been sick from water and air pollution due to the practices by the gas companies. Fox travels all over the US, meeting people affected by this hydraulic drilling process, called “fracking,” collecting samples and surveying the land they destroy, land that should be protected and belong to the American people. The film is set up as a great informative narrative. Fox has a moment deciding where to begin, and begins with the beginning of his own life in Pennsylvania. His parents and some hippie friends built a house in the woods, with the a beautiful creek that flows to the Delaware River on the land. He grew up naturally, as did the land and is now the owner. When he gets a letter claiming that he could let natural gas companies use his land and he would be paid $100,000 in return, he proceeds with caution. Nearby, other people have already jumped at this opportunity and regretted it. 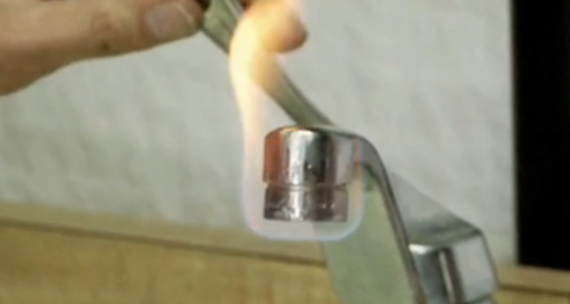 Their water is contaminated to the point that they can light water running out of their faucets on fire. With Fox gathering interviews and evidence, he decides to venture out across the country to find more testimonials. His findings are only bleaker out west. 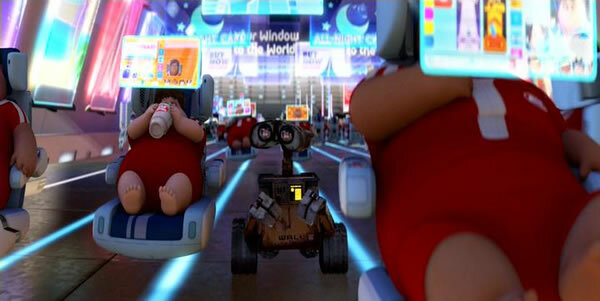 Throughout the film, my outraged grew. I was disgusted, but slightly amused at how families could set their running water aflame. One man showed this to Fox like it was a party trick. But out west in states like Colorado and Wyoming, people were getting very ill, even contracting brain damage and cancer, due to the toxins they had been exposed to, both in the water and air. My boiling point came with the knowledge that these fracturing practices were all over natural, public land. Land that should be protected by the Bureau of Land Management. It was about a year ago now, that my husband and I took a trip to Yosemite and Sequoia National Parks. Until then, the only natural land I had seen between St. Louis and LAX was from an airplane. Somewhere in that hike up the Mist trail to Glacier Point I became forever thankful for the good people that preserved the natural beauty of the world. I don’t consider myself a tree-hugger or a young hippie, but if we have to take sides, I’ll stand proudly with them. Before leaving the film screening, I signed a petition to keep fracking out of Alabama’s forests. 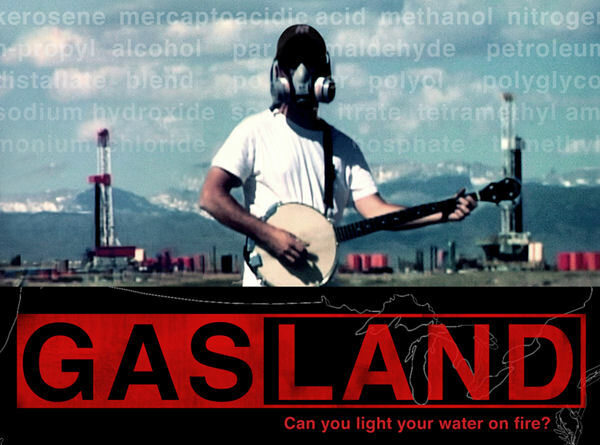 GasLand is a smart documentary with just as much brains as heart. Fox’s story draws us in, the people’s stories fill it out and the outrage over what the government lets the gas companies get away with is infuriating. 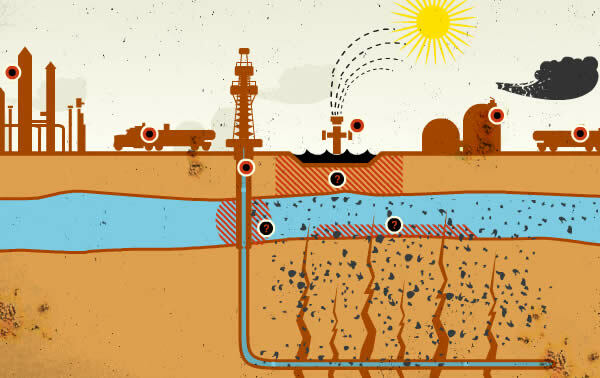 Along the way, technical ideas and processes of fracking are illustrated in various ways, that make them easy to comprehend. Many times, technical details or incriminating fine text are presented like an animated infographic, laying everything out plain to see, oftentimes highlighting big, nasty chemicals and mind-boggling loopholes. 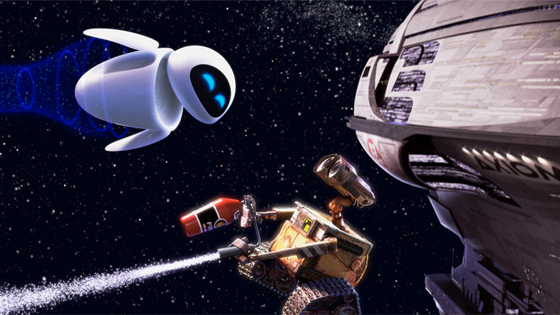 It’s hard to take the industry’s side after seeing GasLand. The fact that no one in connection to them refuses to drink the water, and many refused to be interviewed (get a good look at the end credits), instantly makes us incriminate them. The evidence Fox collects is indisputable and functions to serve justice. Sadly, justice is still nowhere to be found. Natural gas companies are simply buying off those affected and forcing them to shut up. There is a real sense of hopelessness as these people are repeatedly lied to by companies and cheated by their own government. Fox presents a real fear that this contamination of our water can spread and with more land being bought and considered for fracking, it hits closer and closer to home. The health and wellbeing of people and the land are things we all should value above money and industry, and what is happening here contradicts all of that. This is a film that everyone needs to see, before it’s too late.